1979 The Master Chorale was founded by Dr. Robert Summer, Director of Choral Activities at the University of South Florida. The first performance included 19 select singers along with the USF University Singers and Orchestra in a performance of Bach’s St. John Passion at the University. 1986 The Chorale was officially designated the principal chorus of The Florida Orchestra. 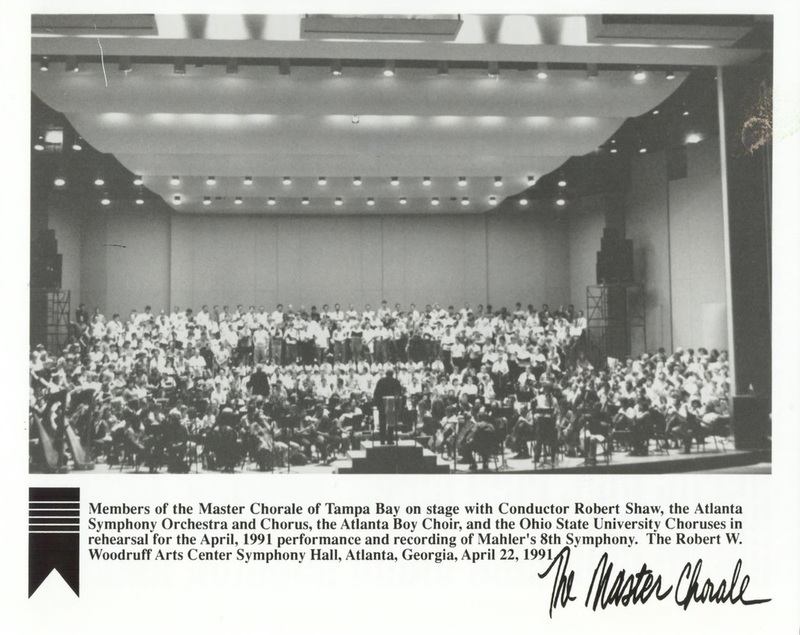 1988 The Chorale performed Durufle’s Requiem with legendary conductor Robert Shaw, music director and conductor of the Atlanta Symphony Orchestra and interim music director of The Florida Orchestra. 1991 The Chorale performed Mahler Symphony No. 8 with Robert Shaw and the Atlanta Symphony Orchestra and Chorus in Atlanta, GA. A CD recording of this performance was released on the Telarc label, and garnered international acclaim and attention. This recording continues to be available for purchase through CD retailers and iTunes. 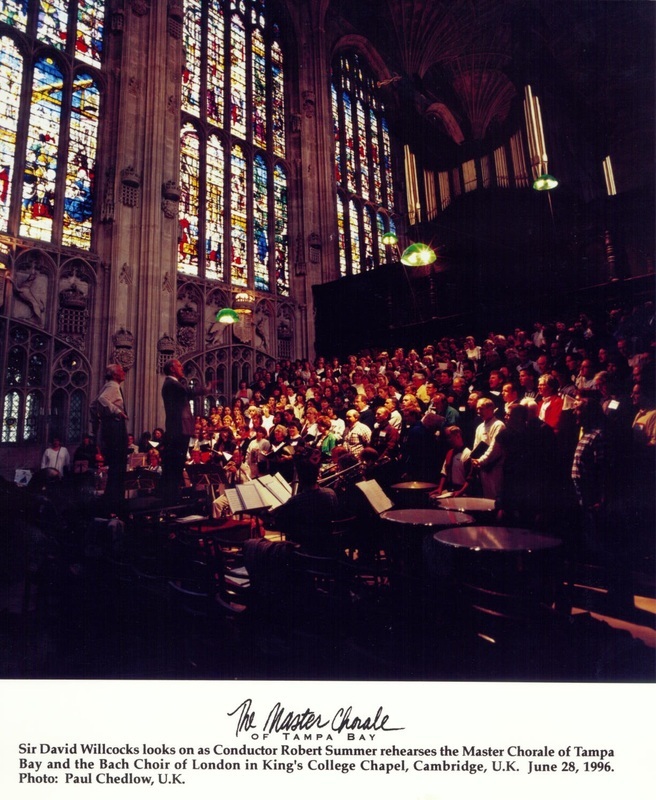 1992 The London Bach Choir, directed by Sir David Willcocks, joined the Chorale for performances in St. Petersburg, Florida at the Mahaffey Theater. 1996 The Chorale embarked on its first European tour in performances of the Berlioz Requiem with the London Bach Choir at both Westminster Cathedral, London and King’s College Chapel, Cambridge. 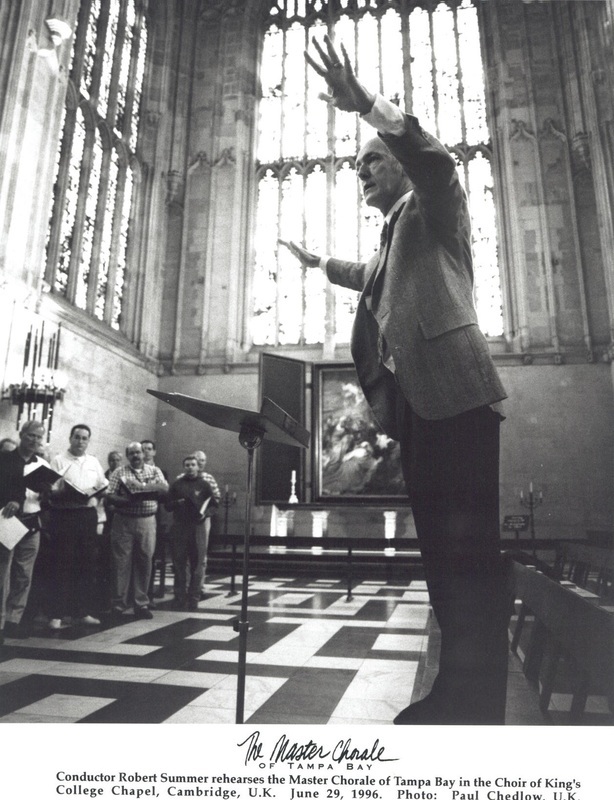 The featured conductors were Dr. Robert Summer and Sir David Willcocks. 1996 The Chorale’s second CD recording, Christmas with the Master Chorale, was released, and immediately gained critical praise. Additionally, the Chorale was a featured guest at the inaugural opening of the Tampa Bay Ice Palace (Amalie Arena). The Chorale was named Artist in Residence at the University of South Florida College of Fine Arts in recognition of its leadership in and impact upon education and performance in the choral art form in West Central Florida. The Chorale recorded its fourth CD with the world-famous Empire Brass entitled "Christmas with The Master Chorale and Empire Brass." The Chorale received its second NEA grant for its new educational outreach program, Festival of Voices. 2000 The Chorale commissioned world-renowned composer and conductor Eric Whitacre to write a piece for a cappella choir. The result was a work entitled Lux Arumque, which remains one of the most popular compositions of standard choral literature, and has sold hundreds of thousands of copies around the world. 2005 The Master Chorale of Tampa Bay with The Florida Orchestra released the CD, A Musicological Journey Through the Twelve Days of Christmas by Craig Courtney. 2007 The Master Chorale presented the Florida premier performances of Richard Einhorn’s multi-media work Voices of Light with Carl Th. Dryer’s black and white silent film masterpiece, “The Passion of Joan of Arc” scored for choir, orchestra and soloists. The Chorale presented its Discover! Alice Parker concert series. Through this Discover! Series, the Master Chorale commissioned and performed the world premiere of Ms. Parker’s now-famous The Rock and the River. and prepared to celebrate its 30th Anniversary. The Master Chorale with The Florida Orchestra recorded and released a CD of music by composer Frederick Delius for national distribution by the Naxos of America label which made it to #1 Best Selling Opera/Vocal recording on Amazon and #2 on iTunes. The Master Chorale released a CD recording of The Peace Project featuring a variety of choral music, including a premiere of an André Thomas commission. 2013 The Master Chorale of Tampa Bay performed Beethoven's Symphony No. 9 with The Cleveland Orchestra and The Master Chorale of South Florida at the Adrienne Arsht Center for the Performing Arts in Miami. The Master Chorale recorded the Holiday Pops program with The Florida Orchestra for CD release and recorded and released the live performance of “Upon These Shores” on CD. 2015 The Master Chorale launched a new “voice” – The Master Chorale Ensemble Singers. The Master Chorale said goodbye to Dr. James K. Bass, the Chorale's fourth Music & Artistic Director, as he departed to take the highly respected role of Director of Choral Studies at the Herb Alpert School of Music, University of California Los Angeles. Released the "Light of the Midnight Sun" CD, conducted by Dr. James K. Bass, which reached #6 on the Top 10 selling classical albums on iTunes. Performed the National Anthem for a Tampa Bay Buccaneers game at Raymond James Stadium. Launched a new Youth Initiative reaching 1,000 Title I elementary students in Hillsborough and Pinellas Counties. Collaborated with the Choral Artists of Sarasota and the Sarasota Orchestra for the first time with a performance of Verdi's Requiem at the Sarasota Opera House. Presented Tampa's first community BIG SING, where the audience is the choir. 2017 The Master Chorale appointed Doreen Rao as Visiting Artistic Director. 2018 Brett Karlin appointed fifth permanent Artistic Director.